Mayor Robert Brain honored several Elizabethtown Police Department police officers for their work to track down the perpetrator in an armed robbery and find a weapon that was discharged during the robbery. 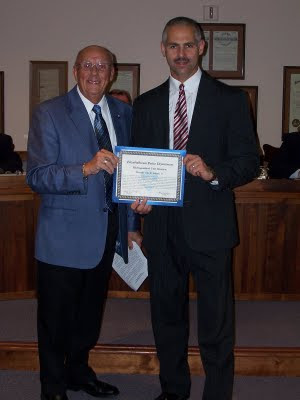 During Borough Council's Sept. 17 meeting, Brain presented a unit citation to Detective John Emerick. Others who were part of the unit and recognized but did not attend the council meeting were Corporal Gordon Berlin and Officers Michael Lyons and Matthew Shuey. The officers were called to an incident on West High Street that was reported as a fight with firearms. Before they arrived, a weapon was discharged. No one was injured. Upon arrival, and with help from the Northwest Regional Police Department, the officers tracked down the suspects to a location on North Poplar Street and took them into custody without further incident. During the investigation, they learned that the weapon had been stolen from a neighbor's house. Brain praised the officers for their efforts, saying the incident "clearly illustrates how teamwork and training" result in a safer community. The ironic part of this story is that Brain also reported at the meeting that the National Rifle Association has started a grassroots campaign to pressure him and other mayors to resign from a coalition called Mayors Against Illegal Guns (MAIG). Brain joined the coalition this summer, along with several mayors in the area, in response to a wave of violence, shootings and murders in south central Pennsylvania cities, most notably Harrisburg. Brain stated very plainly that he is refusing to resign from MAIG. In a letter in response to the NRA's pressure, he said, "I think we in law enforcement in Elizabethtown and North West Lancaster County are truly blessed to live in a community environment that does not test our officers daily with the use of illegal guns. Yet on the other hand we cannot ignore what is happening close by jurisdictions that also affects our quality of life." As the incident above indicates, Elizabethtown is not immune to illegal weapons. Nor is the community immune to violent crime, as the murder of Ray Diener in May 2007 illustrates. In fact, two of the suspects in that case have been convicted, with trigger man receiving the death penalty. So the timeliness of the NRA's efforts could not be more ironic. And while I and Mayor Brain and many others support the Second Amendment, Councilman Tom Shaud said it best: MAIG stands in opposition to illegal guns.